A government review into the desirability, purpose and functioning of sharia councils (ie sharia courts) has been 18 months in the making. It was instigated by Theresa May when she was Home Secretary, in the context of allegations of the misuse or abuse of sharia codes of law in the treatment of women (particularly in divorce, domestic violence and child arrangement cases). Their rulings in this regard were frequently discriminatory, contrary to equality, oblivious to liberal democracy, and damaging to communities. The review sought to examine best practice in relation to their governance and transparency, while assuring compliance and compatibility with UK law. Since there is evidence that ECHR Article 9 (2) is engaged (the protection of the rights of others) it seems that there is an obligation on the state not only to respond to these issues through imposing and enforcing statutory duties but to do so effectively. In other words, a proportionate response needs to be an effective response. It is in those circumstances that the panel believes that some degree of regulation is required to achieve that response. This approach is essentially procedural rather than substantive. It is designed to preserve the right of women to seek a religious divorce without risking exposure to discriminatory practices. It is to be noted that in speaking with the sharia councils, none were opposed to some form of regulation and some positively welcomed it. So they propose is state regulatory body – a quango (they specify “similar to OFSTED”) – to ensure that sharia councils comply with UK law. This will lead to the inevitable diminution of religious liberty for all. If the Government establishes a regulatory quango (comprised of unaccountable and immovable state inquisitors) to ensure that sharia councils comply with all aspects of equality legislation and adhere to all precepts of ‘British values‘, apart from the tacit state recognition of sharia law which such a quango would confer, it is difficult to see how equality and anti-discrimination legislation could resist demands for such a quango to oversee (ie regulate) Beth Din (rabbinical courts) and Roman Catholic tribunals. “We will not be taking forward the review’s recommendation to regulate sharia councils. 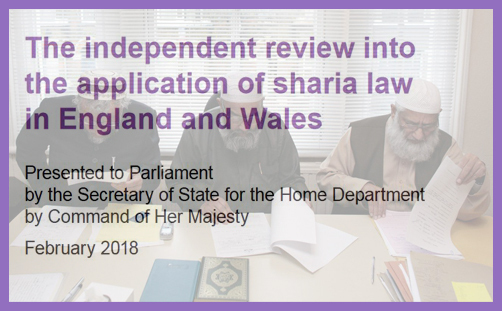 Sharia law has no jurisdiction in the UK and we would not facilitate or endorse regulation, which could present councils as an alternative to UK laws. That raises a dilemma: either the state withholds further intervention or it risks intervention being perceived as conferring legitimacy upon sharia councils and thereby creating a parallel legal system. One either regulates all religious tribunals and councils equally to ensure compliance with state orthodoxy, or one regulates sharia councils exclusively, which is patently discriminatory, if not ‘Islamophobic’. How do you solve a problem like sharia?